Reginald Hughes stands outside his home on Champlain Ave.
Reginald Hughes has called the Pullman neighborhood home since 1970. Over the decades, he has witnessed the once thriving community fall into a steady decline. Yet, recently his hope has been restored. Throughout the course of 2012 Reginald has watched as Mercy Portfolio Services worked with Chicago Neighborhood Initiatives and Safeway Construction Company to transform Champlain Avenue, the street where he has lived for over forty years. According to Reginald, the neighborhood has seen tough times. “It was wild, gang infested and crime infested,” he said. Fortunately, the City of Chicago selected this historic neighborhood to participate in the Neighborhood Stabilization Program. 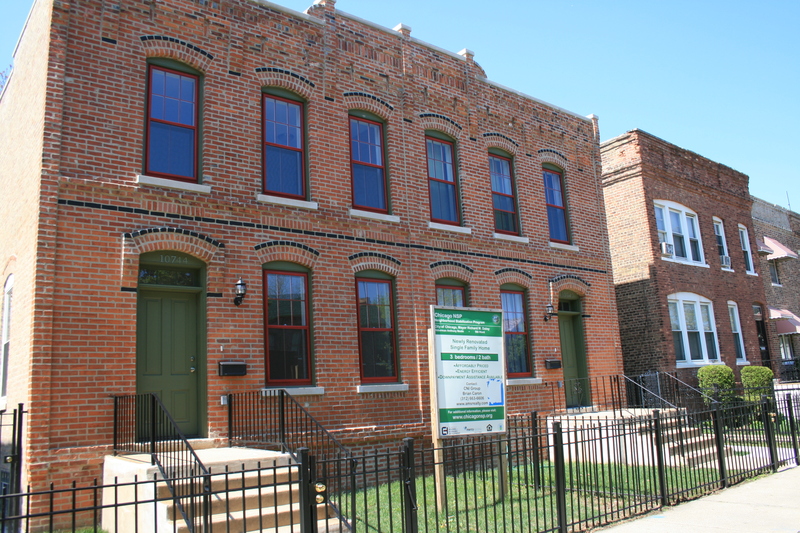 Mercy Portfolio Services is utilizing funding from the program to purchase abandoned and foreclosed townhomes and renovate them in partnership with Chicago Neighborhood Initiatives and Safeway Construction Company. To date, eleven vacant homes have been acquired and five have been renovated. Reginald, who also owns and manages several apartment buildings in the community, reiterates that as a stockholder in the community he is happy to see these improvements. Ultimately, this work will help to revitalize neighborhoods and protect property values throughout the city. As a Pullman homeowner, Reginald is grateful. “Well, for me personally, thank you Mercy Housing for coming into this community, picking this community out to make a drastic change, because we really needed it,” he said. For more information on Mercy Portfolio Services and the Neighborhood Stabilization Program please visit, www.chicagonsp.org.